I saw the movie Gummo by Harmony Korine in 1999. I was living on my friends couch in the living room in Cedar Rapids, Iowa. I remember liking it at once. 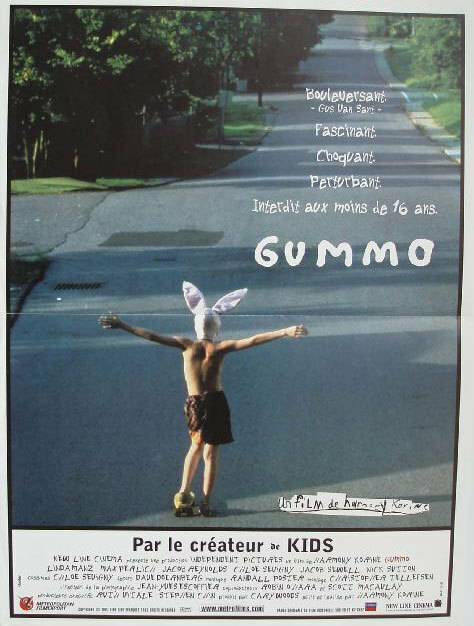 I saw Kids when it first came out and liked it also, but Gummo blew it out the water for me. In 2001 I sampled Gummo’s cowboy kids cussing at the rabbit for a song that doesn’t exist anymore. Then in 2004 I sampled the sounds in the film arriving with “Don’t Forget to Water the Radio”. A demo was recorded, then in 2010 I re-recorded the song with the same exact Gummo Sampled beat and hook, but changed the lyrics slightly. Since 2004 my songwriting became a little less enigmatic. The song was put on my 2nd album “Swimming to Cambodia”. In 2001 I sampled Gummo’s cowboy kids cussing at the rabbit for a song that doesn’t exist anymore. Then in 2004 I sampled the sounds in the film arriving with “Don’t Forget to Water the Radio”. Everything from the percussion to the ambiguous metal and feedback was made with Gummo samples. A demo was recorded, then in 2010 I re-recorded the song with the same exact Gummo Sampled beat and hook, but changed the lyrics slightly. Since 2004 my songwriting became a little less enigmatic. The song was put on my 2nd album “Swimming to Cambodia”. PS: The title of this post implies there’s only one way to sample aka flip the Gummo sample, but that’s not true at all. Everyone has their own techniques, equipment, ear, style, etc.